Jose Mijares pitched another scoreless inning for Class AAA Rochester on Saturday, giving him 6 1/3 scoreless innings to start the season. But even with their bullpen concerns mounting, the Twins are in no hurry to promote the lefthander to the major leagues. "He's doing fine, but it's early," Twins General Manager Bill Smith said. "His approach is good. He's working hard." Kevin Slowey and Jason Kubel had separate missions for the Twins on Saturday night. After two rough starts, Slowey needed to rethink his approach. Strange as it sounds, his goal was to throw fewer strikes. Kubel didn’t want to change anything. After batting for the cycle and hitting a game-winning grand slam in Friday’s comeback victory, the challenge was not overdoing the encore. In both cases, it worked. 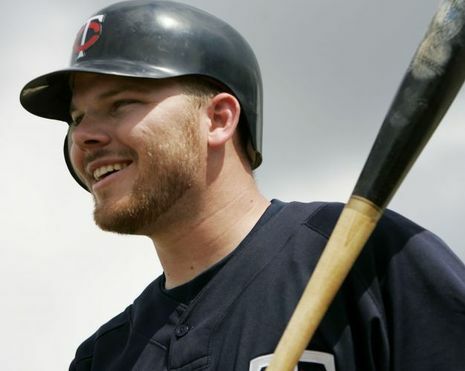 Outfielder Jason Kubel, who has overcome a serious knee injury to become a big-time contributor to the Twins, has become quite a clutch hitter with the bases loaded. "I usually feel good in bases-loaded situations," Kubel said after his eighth-inning grand slam in Friday's 11-9 come-from-behind victory over the Los Angeles Angels. "I feel like I usually put pretty good swings on the ball."